Born in 1971 in Odessa, Ukraine. Graduated Odessa Art College named after M. Grekov. Lives and works in Odesa, Ukraine. 2011 White Spirit, Gallery "HudPromo", Odesa, Ukraine. 2010 Sculptural Salon, Kyiv, Ukraine. 2009 Kosmofan, Yatlo Gallery, Odesa, Ukraine. 2008 Punk Glamour, gallery Rabouanmussioun, Paris, France. 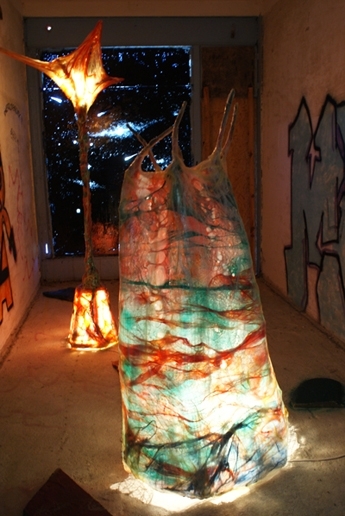 2001 Light.Lab, RA Gallery, Kyiv, Ukraine. 1997 The ethereal laborary, artist's workshop, Odesa, Ukraine. 1995 Untitled, Kinburgskaya Spit, Odesa, Ukraine. 2010 Exhibition on Fence-2, on the restoration forests of Maritime Museum, Odesa, Ukraine. Project "Year", Yatlo Gallery, Odesa, Ukraine. Top10 Odessa artists, Gallery "HudPromo", Odesa, Ukraine. New Man, international symposium of contemporary art "Biruchiy 0010", Zaporizhya, Ukraine. Second Biennial of Odessa, Odesa, Ukraine. 2009 Bloomsday, gallery "Collection", Kyiv, Ukraine. RESTART, Sea Art-terminal, Odesa, Ukraine. All by 3, NORMA Gallery, Odesa, Ukraine. Stroprogress, Hall house under construction, Odesa, Ukraine. 2007 I believe, "Winery", Moscow, Russia. 2006 Laz Drinker, Odesa, Ukraine. Orange Summer, the gallery "Regina", Moscow, Russia. 2005 New Year, gallery "VUM-VUM", Odesa, Ukraine. Laboratory of the World, gallery "Regina", Moscow, Russia. 2004 Workshop Art Moscow, Central House of Artists, Moscow, Russia. 2003 First Collection, House of Artists, Kyiv, Ukraine. Donumenta, Showroom of Regenzburg, Germany. 2002 Collaboration, Contemporary Art Center, Kyiv, Ukraine. 2001 International Land Art Festival, Pereslavl-Zaleski, Russia. Noble only understanding of their own lack of understanding, Gallery of the Union of Artists of Ukraine, Kyiv, Ukraine. 2000 The positive reaction, Museum of Western and Eastern Art, Odesa, Ukraine. Crime, State Memorial Museum of Pushkin, Odesa, Ukraine. Contemporary Photographers of Ukraine, Saloniki, Greece. 1 + 1, Gallery "Lavra", Kyiv, Ukraine. Clean room, club "Industrial Area", Kyiv, Ukraine. Two Sides, Gallery Center for Contemporary Art at NaUKMA, Kyiv, Ukraine. Ecology of Soul, International Art Festival, Palace of Arts "Ukrainian House", Kyiv, Ukraine. New Directions, Gallery of the Union of Artists of Ukraine, Kyiv, Ukraine. 1999 Cynicism, Ukrainian Stock Exchange, Kyiv, Ukraine. Taste of the other, the club-restaurant "Tokyo", Kyiv, Ukraine. Contemporary Photographers of Ukraine, Dee, France. When the screens are thinner, Passage de Retz, Paris, France. The Wolf Man, Festival of slide films, Gallery "Tierce", Odesa, Ukraine. Mirage, Gallery Center for Contemporary Art at NaUKMA, Kyiv, Ukraine. Screening, Gallery of the Union of Artists of Ukraine, Kyiv, Ukraine. TV-lization. Episode 2, Center for rehabilitation of children, Odesa, Ukraine. 1998 Purple Velvet, Cultural Center "House of sailors", Odesa, Ukraine. Academy of Cold, State Art Museum, Odesa, Ukraine. Museum under water, Provinciaal Museum, Hasselt, Belgium. 1997 New File, International Festival of contemporary music "Two days, two nights", exhibition hall Sea Port, Odesa, Ukraine. Photo ... synthesis, Gallery of the Union of Artists of Ukraine, Kyiv, Ukraine. Greenhouse affect, Gallery Center for Contemporary Art at NaUKMA, Kyiv, Ukraine. 1996 Shamans are striking, Gallery DADA, Odesa, Ukraine. In the black hole, the TV-club, Odesa, Ukraine. Phantom Opera, Abandoned Theater "Young Spectator", Odesa, Ukraine. 4 rooms, Gallery DADA, Odesa, Ukraine. March Weekend, DADA Gallery, Odesa, Ukraine. The death of "Titanic", The abandoned "Theater of Puppet", Odesa, Ukraine. 1995 Wild Shadows of Love, Museum of Western and Oriental Art, Odesa, Ukraine. Kandinsky syndrome, State Museum of Regional Studies, Odesa, Ukraine. Dr. Frankenstein's office. Neo-chimerism, Basement of the House of Scientists, Odesa, Ukraine. 1994 Space of the Cultural Revolution, Palace of Arts "Ukrainian House", Kyiv, Ukraine. 1992 Dialogue with Ukraine, Villa Stuck, Munich, Germany. Post Anesthesia, Grassi Museum, Munich, Germany. 1991 New Figures, Museum of Literature, Odesa, Ukraine.